THIS YEAR OUR BENEFICIARY IS THE MONDULI CHILD DEVELOPMENT CENTER IN TANZANIA (AFRICA). GOAL: $22199.51 DEADLINE: 12/24/2018. YOUR MONEY HAS POWER. SPEND IT MAKING A WORLD OF DIFFERENCE. People living in the United States have the collective power to catapult 884 million people out of extreme poverty in just one weekend. How? By meeting one fundamental need–access to clean drinking water. 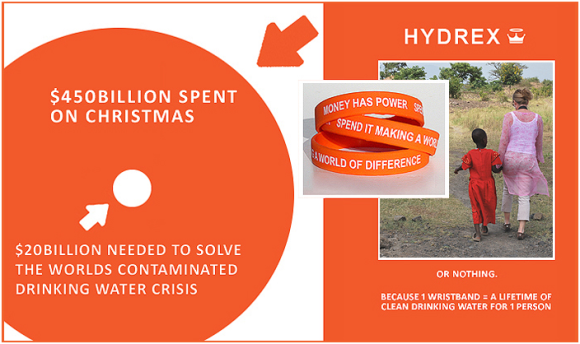 Solving the worlds contaminated drinking water crisis will cost an estimated $20billion. That may sound like a lot, but it’s not, especially considering that Americans typically spend more than $60Billion on Black Friday and another $450Billion+ for Christmas. Rather than spending money on “stuff” that will soon be used up, broken, or forgotten, how about making a world of difference? Our beneficiary for 2018 is 289 children, their families, caregivers, and educator at the Monduli Child Development Center in Tanzania Africa. Given the choice between dying of thirst and drinking deadly water, 5000 children under age 5 die every day from illnesses caused by ingesting contaminated water. Every $20 you spend here will provide access to clean drinking water for one person for a lifetime, $500 will provide access to 25 people for a lifetime. Access to clean drinking water is a critical step in breaking the cycle of poverty, ending injustice, and preventing death. Thanks to our sponsor and parent company, Peter Beaton Inc (who funds all of our overhead, marketing, and product costs), 100% of your dollars will support programs that bring clean drinking water to underserved communities through Compassion International. The minimum purchase is $20 and there is no maximum allowance, so please spend generously! This pledge drive ends on December 24, 2018 at midnight. Any contributions that take us over our goal will benefit our next water well project with Compassion International. Thank you for your generosity. We truly appreciate it.